It’s a balmy day at the end of summer, and I’m sitting in a tranquil room in a Greenwich recording studio, with not just one recording device facing my soon-to-arrive interviewee, but three. Yes, when you’re offered the opportunity to interview Jools Holland for a 20-minute session face-to-face at his famous studio, Helicon Mountain, you come prepared. Jools bounces in, right on time, looking quizzically at my neat row of recording contraptions. In fact, the first thing he says is that he likes the way that I’ve propped one up on a nice piece of tartan cloth. He looks just like he does when I’ve watched him on the television: the bright open smile, relaxed manner, informal attire. Jools might be relaxed, but I’m not, as I’ve only got those precious 20 minutes with him. But he says there’s no rush at all. Phew. I like him already. For those of you unfamiliar with the name Jools Holland, he’s the British pianist, bandleader and TV presenter – oh, and ‘king of boogie-woogie’. And he’s busy. As you flick leisurely through this magazine, Jools will be whizzing around the UK with tour dates in London, Newcastle, Birmingham, Manchester, Nottingham, Cardiff, among other places. He has his BBC Radio 2 programme on Monday nights at 11pm and of course his famous show Later… with Jools Holland, which appears on Friday evenings on primetime TV (some 42 series to date). Don’t forget his cult-like Hootenanny, the annual TV show that sees in the New Year. That show hits the 20-year mark this year and I’d imagine he’s preparing for it already. No wonder I’ve been allocated only 20 minutes with Jools. I’m here to talk piano playing. I want to know how he has created his ‘once heard, never forgotten’ style. What’s his secret? It all began, as it often does, with the influence something or someone. Jools tells me, ‘The first thing that I remember was hearing my Uncle Dave play boogie-woogie.’ (Uncle Dave played bass in a blues band called the Planets.) ‘It was fascinating, particularly the staccato and percussive way that he played it. His left-hand style was the same as the left-hand style Ray Charles had learned from an old man in his town, and the same left hand that Dr John’s aunt had shown him! Obviously, it must have had the same sort of effect on lots of people. Hearing Dave play stimulated me to want to learn boogie-woogie music and piano music. [Cont.] 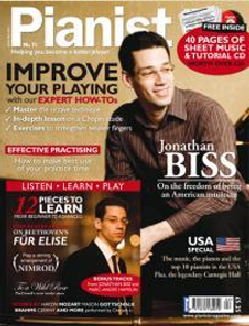 Read the full interview in issue 75 of Pianist. In the meantime, here are some of our favourite of Jools at the piano... And in the meantime, here are some of our favourite clips of Jools on the piano! Jools Holland Bloodsucker Blues Live Jools Holland on the Golden Age of Song Jools Holland Hootenanny 2008-9 Jools Holland explores the Clavinova Jools Holland with Amy Winehouse Paul McCartney with Jools Jools Holland opens the Jools Holland Festival of Boogie Woogie Dr John and Jools Holland Recorded at an outdoor concert in the summer 2013 Charlie Watts, Ben Waters, Axel Zwingenberger and Jools Holland show their skill and their love of the boogie woogie..